I came across a blog posting titled “Bad beekeeping” over at ScienceBlogs.com. 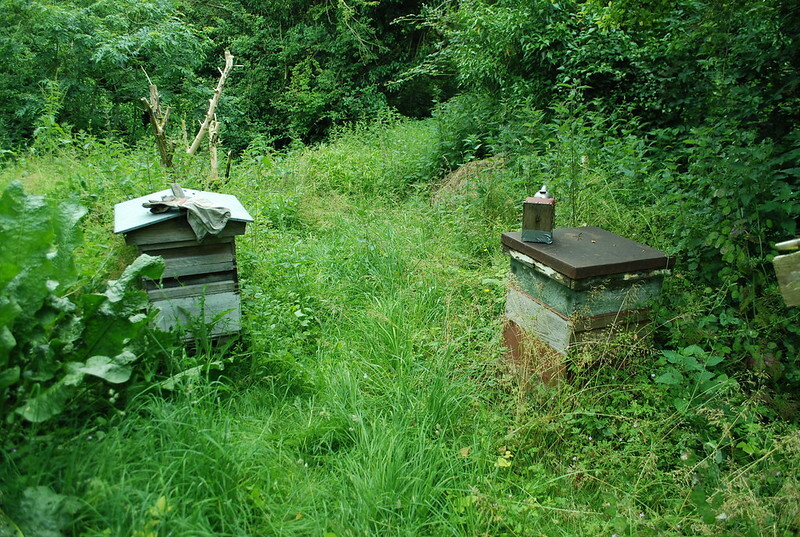 I was concerned that someone had picked up on my nomen – not that I have universal rights on the bad beekeeping phrase. But I wrote the book called Bad Beekeeping way back in 2004 and I was pretty sore when a few years later, a game-show host dancer in London named Bill Turnbull put out a series of Bad Beekeeper Club books. Turnbull’s books will do you no good, so don’t bother to spend your honey money on any of them. 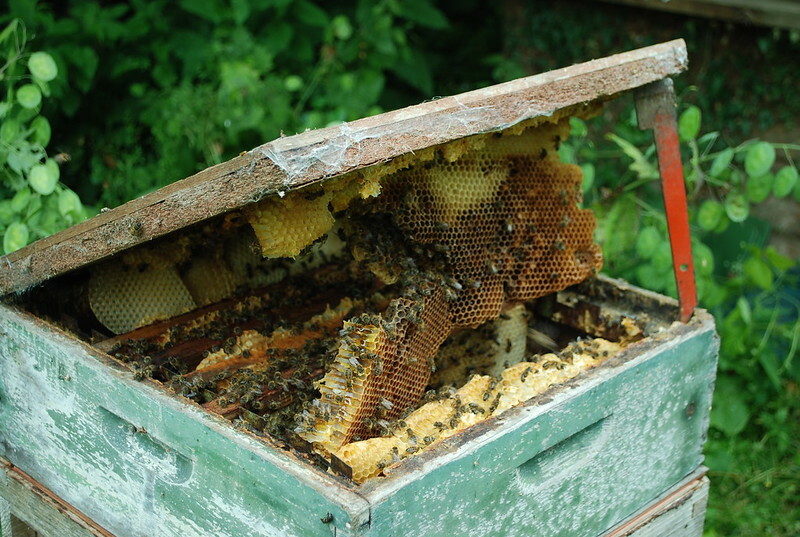 With Turnbull out there, you can understand my anxiety when I found a blog titled Bad beekeeping. But that’s not the name of the blog, it’s just one entry’s title among many interesting articles written by William Connolley. His blog is called Stoat: Taking Science by the Throat. 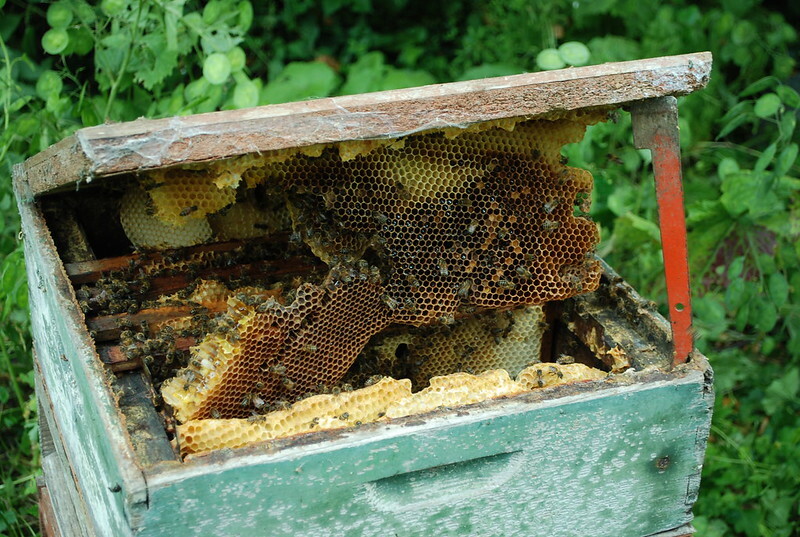 Turns out that Mr Connolley is a legitimate bad beekeeper, possibly much badder than I have been. Here’s one important thought about the stuff that follows. 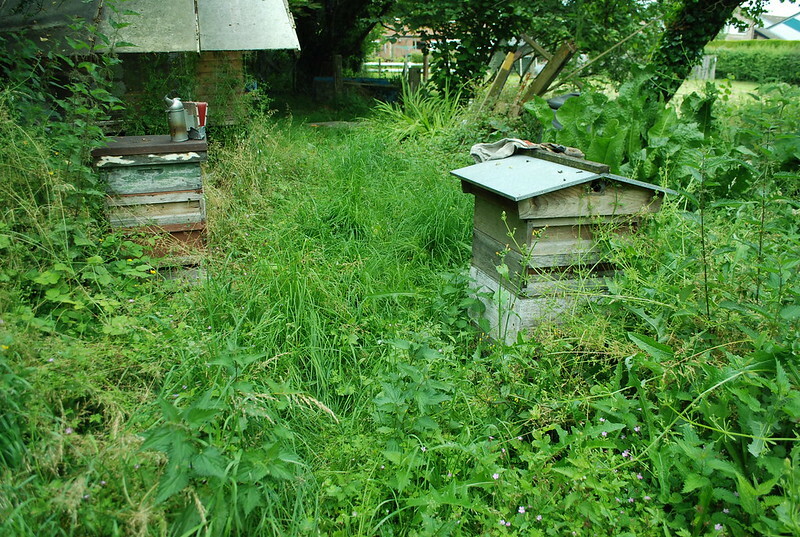 As you look at the pictures, you realize that these bees have been neglected for a year or two. 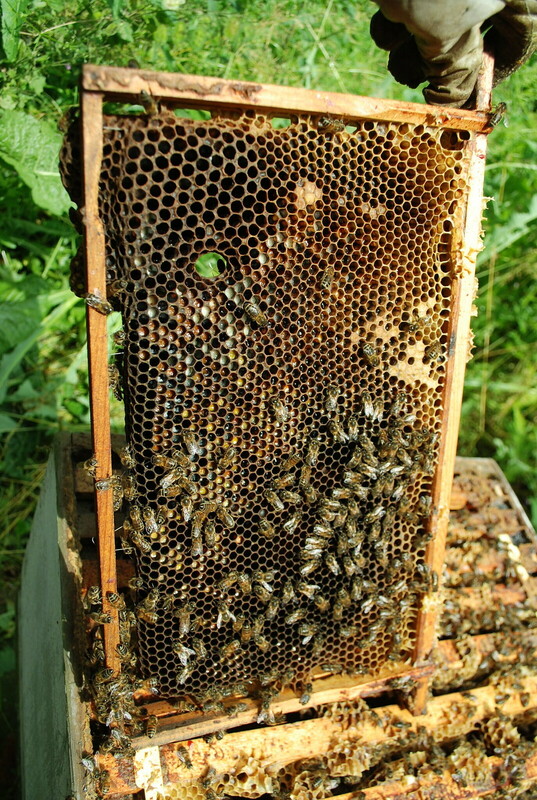 Yet they are alive – without receiving foulbrood mix or varroa treatments for at least a year. 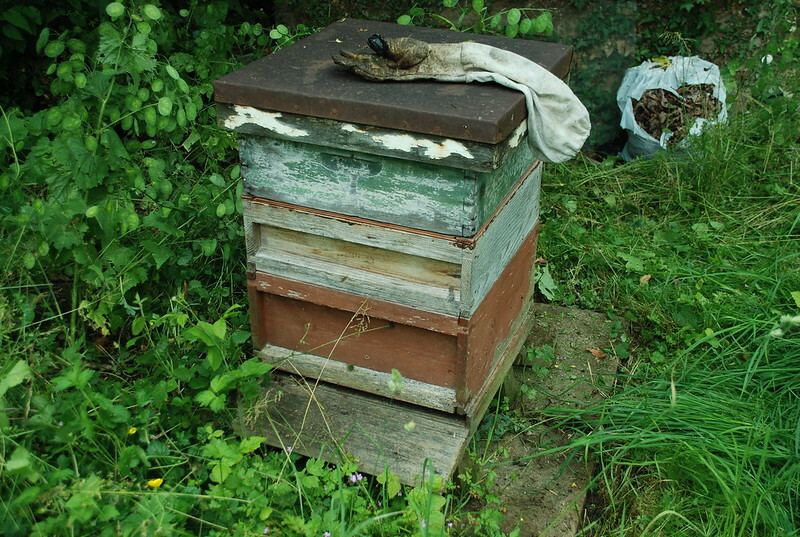 (The fellow admits he left varroa strips in one hive for a long, long time.) However, they aren’t thriving, so they are likely succumbing to mites. And two of the middle pictures show signs of nosema. What do you think? Bad beekeeper or not? 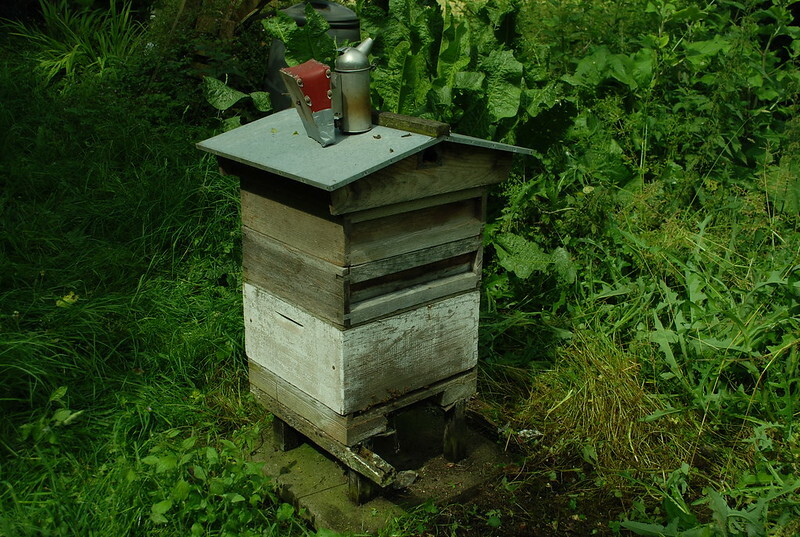 Here’s the blog from Stoat’s Bad beekeeping. Enjoy. And learn. 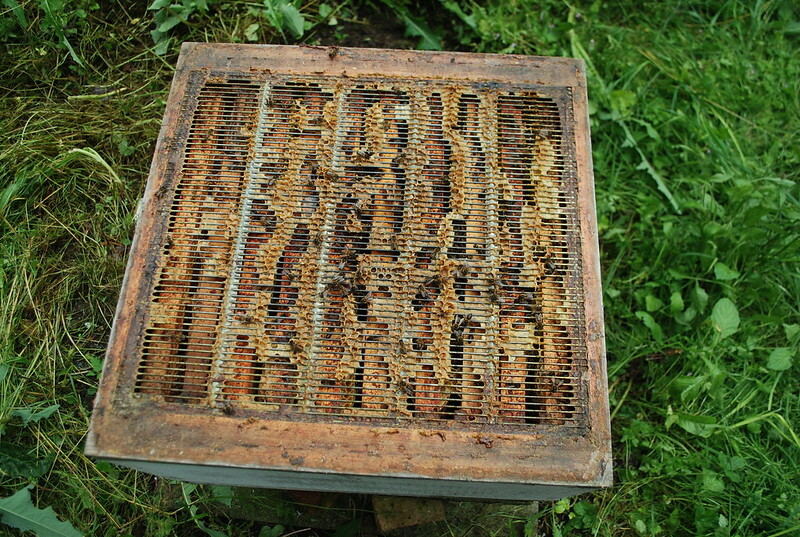 Bad beekeeping: A photographic essay. 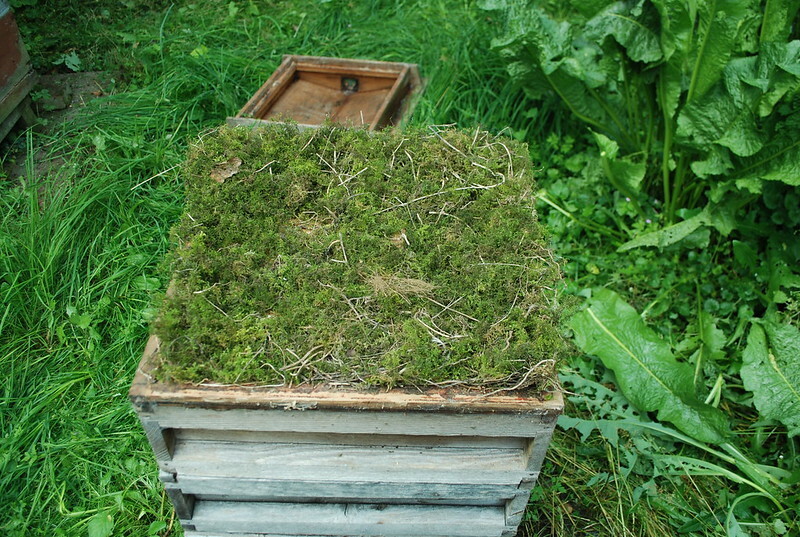 Hive #2, “flattop”, with a smoker on top and surrounded by a carpet of weeds. The bees don’t really mind that, I think. The observant will notice the roof is in rather poor condition – but its been like that for years and not getting much worse – and the queen excluder is above the first super, which is careless of me. 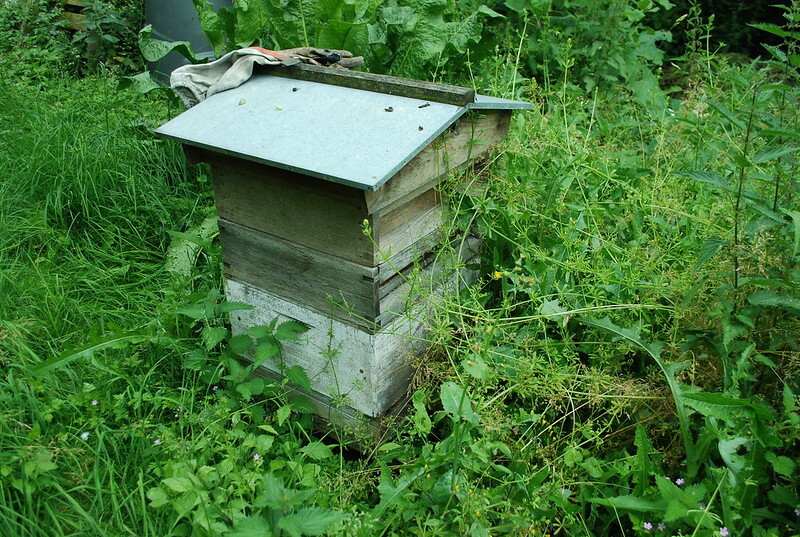 Hive #1 is even more covered in weeds, perhaps a little more than is desirable. The odd blob on top is my gloves. General view, with my shed in the background. Looking the other way to the (not visible) stream at the bottom. The triffid on the left is a horseradish, I’m assured. After some vigorous weed-pulling. The wet June has been bad for weeds, in the sense that they’ve grown well and that’s bad. Hive #1. 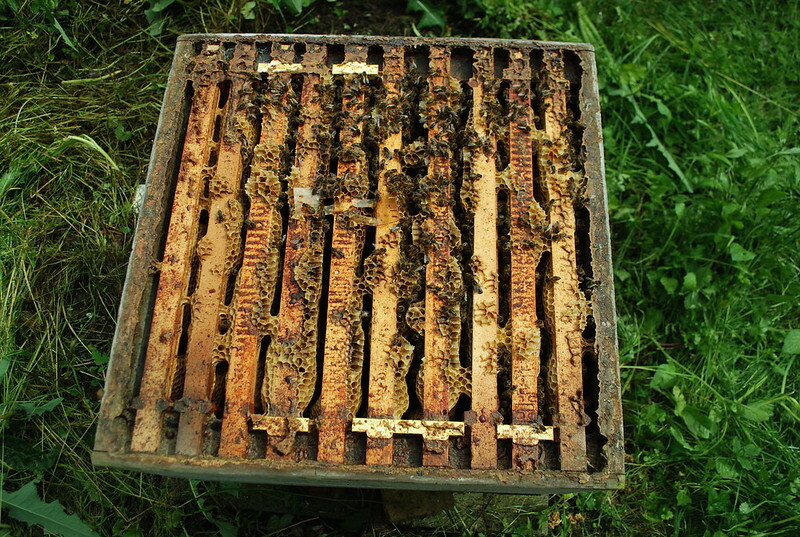 The decayed bit at the front is the “alighting board” but bees don’t need it. And for completeness the de-weeded #2 also. Oh dear. 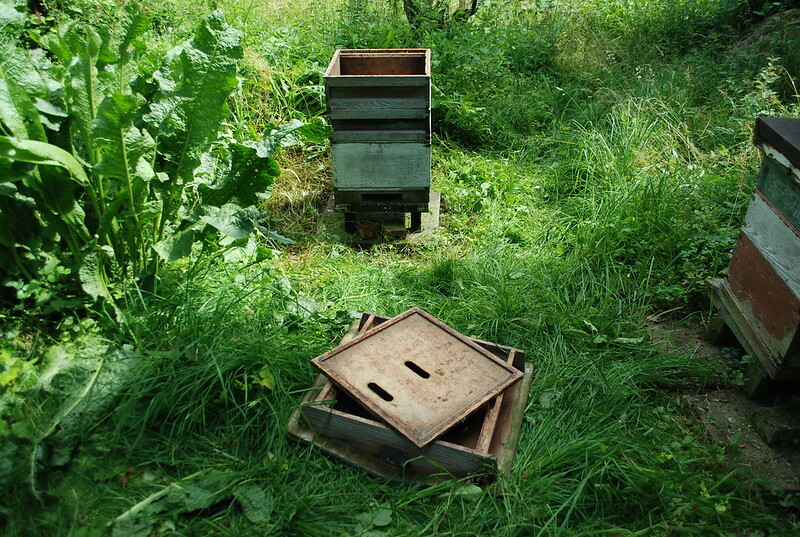 Who left a garden inside the top of my hive? Remove roof and cap board, and all is fairly quiet. Yes, pretty quiet. In a good year, they’d have filled the empty space (that really should have frames in it) with comb. One layer down. 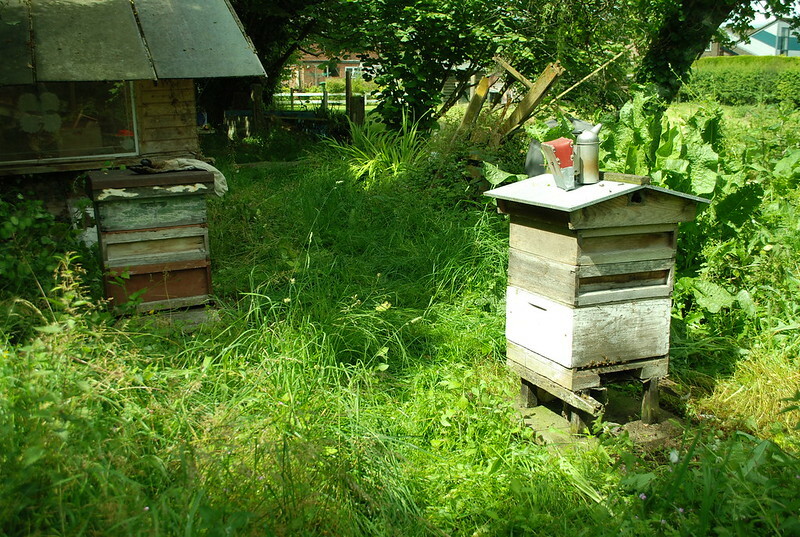 I remember now, I didn’t get round to putting wax into all the frames, but hoped the bees would. But, its all looking pretty thin in there. Not hopeful. Pffft. Is that all? Just one small capped area? Oh dear. 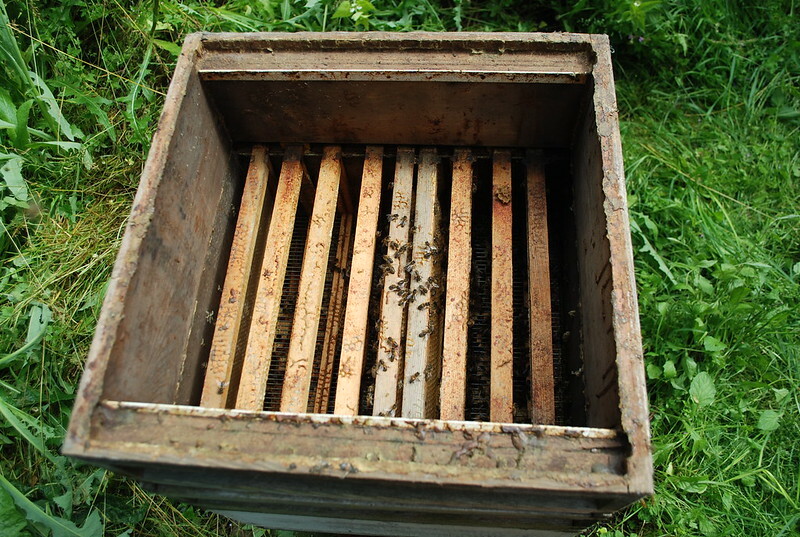 One lower, the top of the brood box, and careful inspection shows I left the Apistan in. I really should not have done that. The brood box. A reasonable but not overwhelming number of bees, and inspection of a couple of frames didn’t show much or any brood. Well, we’ll see. A brood frame. Black as the ace of spades: it really ought to be replaced. Next year. So much for hive #1. What of #2? Oh dear, I didn’t put enough frames in did I? Slightly less obviously, there’s not a lot of honey in all that comb, either. It really hasn’t been a good year. So I took a bit out, and left the rest. Let’s hope the remainder of the summer is sunnier. 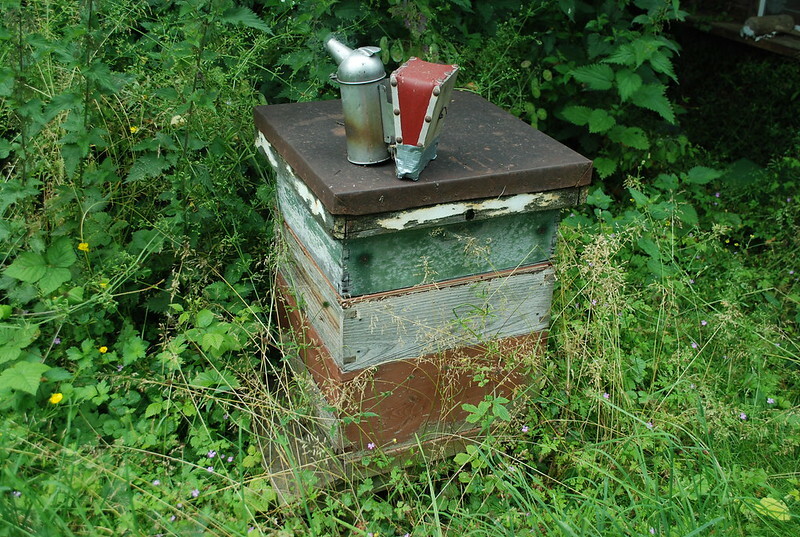 This entry was posted in Beekeeping, Hives and Combs, Humour, Save the Bees and tagged Bad Beekeeping, science blogs. Bookmark the permalink. It’s quite an unusual mess, isn’t it? When I was a state bee inspector in Pennsylvania, I ran across a few small outfits tucked away in apple orchards in the mountains where people had started the bees for pollination, then forgot about them. 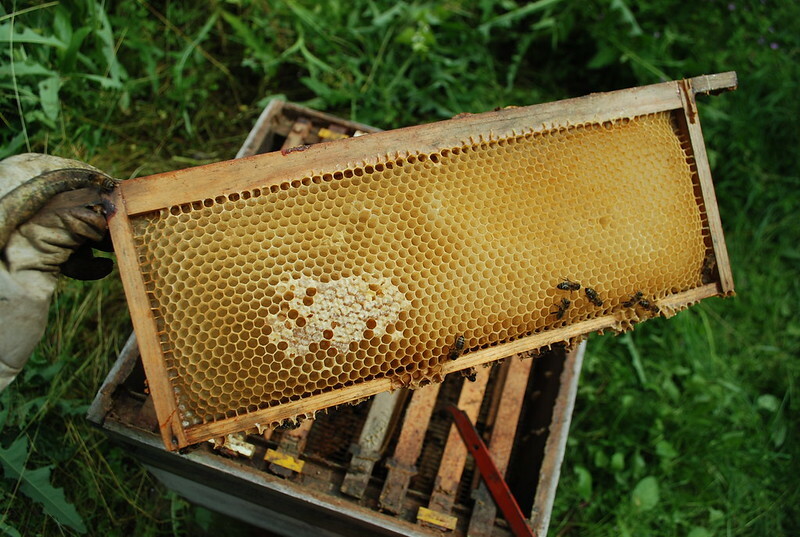 That was back in the days before varroa, but I sometimes found American Foulbrood in those neglected hives. 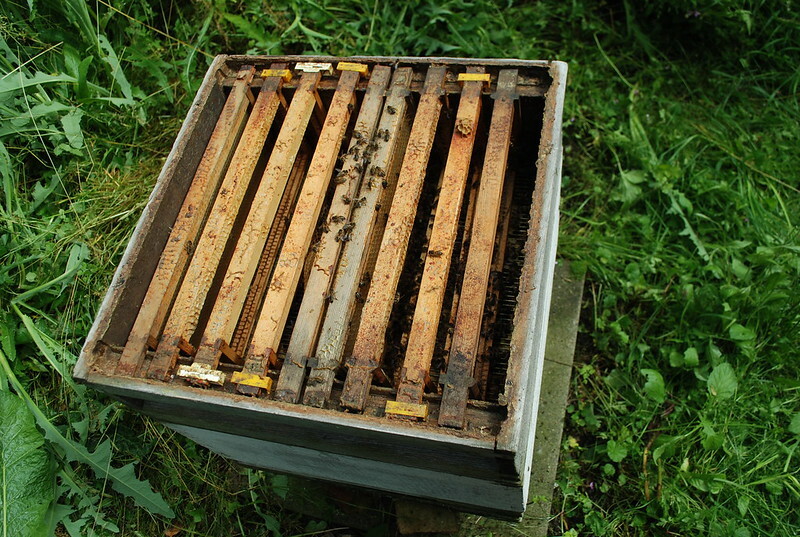 And things were sometimes glued together so badly with propolis and burr comb that it was pretty rough digging in to inspect. Oh dear! But it was kind of him to let you post it. Most people hide their bad beekeeping away. 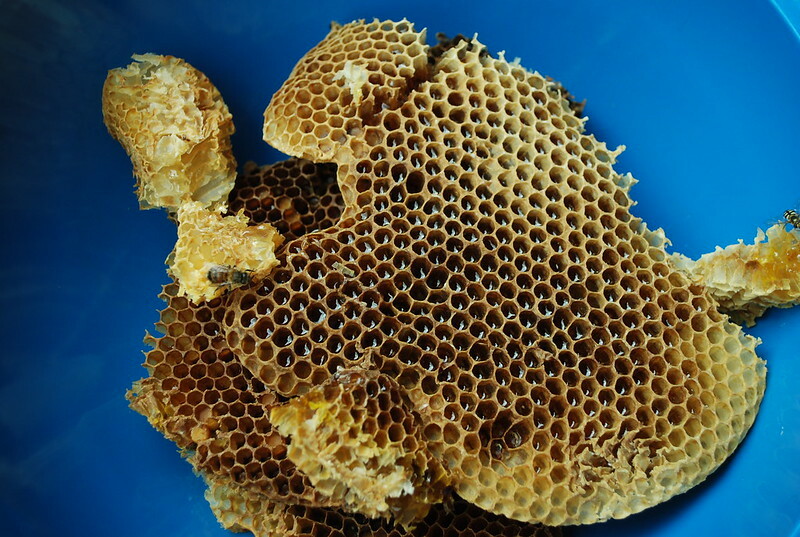 Thanks, Emily – yes, the bad beekeeping science blogger was quite nice about this and his story may be a helpful lesson in what may happen to ignored bees.